The Hilton of Cadboll Stone has had a storied history. 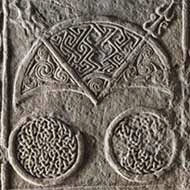 The 7.5' (2.3 m) slab of local sandstone was erected by the Picts near the eastern coast of the Scottish Highlands around the year 800 A.D. On it they had carved intricate designs, apparently to celebrate their conversion to Christianity. Over the years, the monument has been damaged by weather, has been toppled and broken (possibly deliberately), and has been partly reinscribed with unrelated information. It has lain upside down in a local chapel, stood as an ornament in the garden of a Scottish castle, and was finally donated to the British Museum in 1921. The public demanded its return to Scotland that same year, but it has now stepped into the digital age. Between its creation and its current installation, thousands of bits of stone have been chipped away. The National Museum of Scotland has now x-rayed and digitized 3,000 of these fragments and created a virtual 3-D jigsaw puzzle that they are asking the public to complete. The citizen science project – PictishPuzzle.co.uk – will make its debut on October 25th. Archaeologist Mhairi Maxwell says, "We have created a software program that allows people with very average computers to go online and interact with a selection of 3-D objects in real time, push them together and try to place them to solve the puzzle....If we can come together to re-fit the pieces, it will be a huge step forward in our understanding."